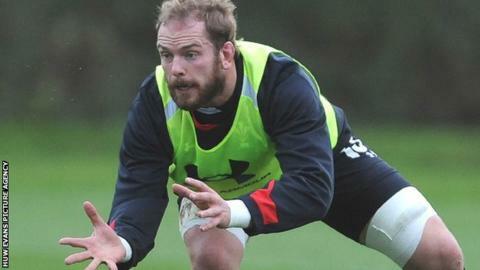 Wales lock Alun Wyn Jones will be available for the Ospreys against Connacht in the Pro 12 League on Friday after being released from Wales' squad. Jones was added to the national squad on Tuesday after missing the last five Test matches through injury. He made his comeback for the Ospreys as a second half replacement against Ulster last Friday. Wales have released 15 players from the squad, eight to Welsh regions and the rest to clubs in England and France. Second row James King is also released to the Ospreys, Josh Turnbull and Liam Williams return to the Scarlets with Scott Andrews, Lou Reed, Josh Navidi and Andries Pretorius rejoin the Blues. The Welsh-based players don't have to be released by the Welsh team management. However, players based outside Wales have to be released under International Rugby Board regulations. So Paul James (Bath), Craig Mitchell (Exeter Chiefs) and Olly Kohn (Harlequins) have been released back to their clubs as have Gethin Jenkins (Toulon), Mike Phillips (Bayonne), Lee Byrne (Clermont Auvergne) and James Hook (Perpignan). Only two of those players - Phillips and Jenkins - are in the starting line up announced by interim coach Rob Howley on Tuesday for the match against Italy on 23 February. Jones has not played for Wales since injuring his shoulder in the defeat by Argentina on 11 November 2012. All the players will return back to the Six Nations squad on Monday, 18 February.